These Delmonico potatoes are super easy to prepare with leftover or freshly cooked and diced potatoes. 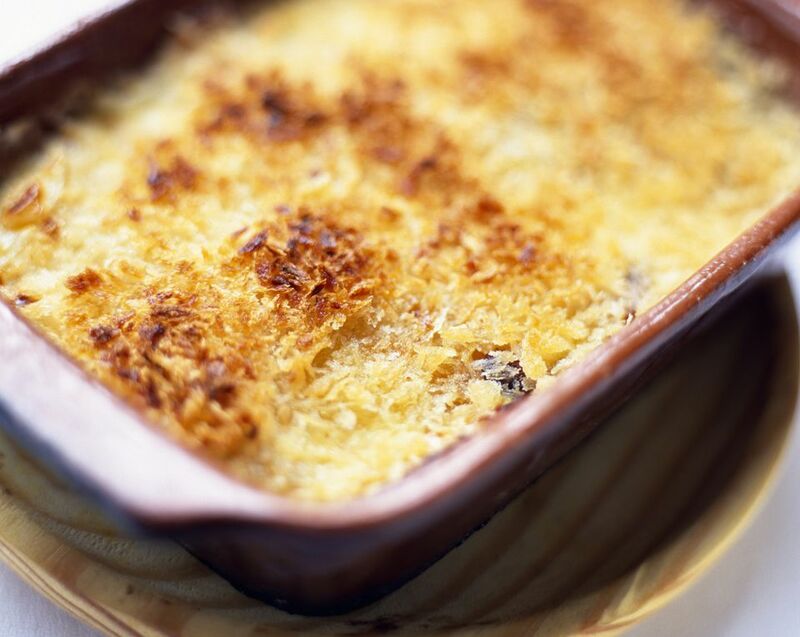 The potatoes are baked in a white sauce with shredded cheese and buttery breadcrumbs. Named after the New York restaurant where they were created, Delmonico potatoes date back to 19th century. This version is made with a simple white sauce and shredded Swiss or cheddar cheese. Generously butter a shallow baking dish. Put the potatoes in a medium saucepan and cover with water. Add about 1 teaspoon of salt and bring to a boil. Cover the pan and reduce the heat to low. Simmer for about 12 to 15 minutes, or until just tender. Drain and set aside. First, make the sauce. Melt 4 tablespoons of butter in a saucepan over low heat; stir the flour into the melted butter. Cook and stir for 2 to 3 minutes, but do not let the roux brown. Gradually stir in the milk and continue cooking over low heat, stirring constantly, until the sauce begins to thicken. Season with salt and pepper. Combine the drained potatoes with the sauce. Transfer the potatoes and sauce to the buttered baking dish. Sprinkle shredded cheese over potatoes. Put the breadcrumbs in a bowl. Melt the remaining 2 tablespoons of butter and toss with the breadcrumbs until they are thoroughly coated. Sprinkle the breadcrumbs over the potatoes. Bake the potatoes for about 20 minutes, or until the crumbs are nicely browned and the casserole is bubbling around the edges. Delmonico Potatoes With Garlic: Press 2 cloves of garlic or mash and mince finely. Add to the butter in the saucepan and saute for 1 minute. Add the flour and continue with the recipe.